* Step 2: Growing After Accepting Christ. In church after church across the country, people are responding to the message of redemption through grace. They become "new believers." They have responded to the call of the Holy Spirit to accept Jesus' sacrificial death on the cross in their places and have repented of their sins. Many come to the Lord with little or no understanding of the Bible and God's plan for their lives. That's the nature of Grace; there is no need to "do" anything, other than "receive" the provision made by God, the Father, in the person of Jesus, His Son, through the urging of the Holy Spirit. Out of their response to His Grace, these new believers are eager to take steps of faith in appreciation for what they have been given. Their first step was to believe and receive Jesus as Lord and Savior. For many, however, the question remains, "So, what's next?" Here are thirty-lesson "teachings" to "answer" this question – Step2. Step2 provides thirty basic tenants of Christianity. Here's one of them, and the rest are downloadable. Watch the video after your 30 day devotions are done. Christians believe that we don’t have to wonder what God is like. We don’t have to guess at His character. We believe God can be known and, to some degree, understood. We believe God has gone to miraculous lengths to reveal what He is like. We see something of God’s nature in the world that He has created. We see much more of His character in the pages of the Bible. Question: So what happens after you accept Jesus as Savior? Ever seen a female giraffe give birth? 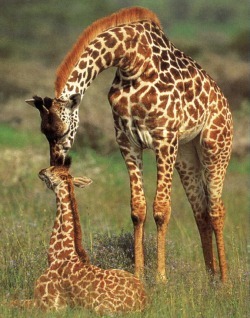 She squats slightly and—BAM!—out pops a baby giraffe. What a jarring entry into the world! But a five-foot fall is nothing compared to what comes next. The new momma proceeds to kick at her stunned newborn until it somehow manages to stand on its wobbly legs. Why?! Because the mother understands there’s a word for newborn giraffes that just lie there doing nothing—they are called “lunch.” Thus her goal is to get her offspring up and moving ASAP. The infant giraffe needs to learn lots of important stuff fast—how to run and eat. It has to get moving, learn the laws of the Serengeti, and develop smarts and strength, or it will become the main course for a hungry lion before the end of the week. The apostle Peter, writing to some new Christians, once put it this way: “You must crave pure spiritual milk so that you can grow into the fullness of your salvation. Cry out for this nourishment as a baby cries for milk” (1 Peter 2:2 New Living Translation). That’s what this e-devotional series is all about—NOT that we’re going to kick you around! (Aren’t you relieved?!) But we DO want to help you get moving for Christ. Like every other new Christian, you need to understand some hugely important spiritual truths. By grasping some fundamental facts about who God is and what he’s done in you, and what he wants to do, you’ll not only survive in this harsh world, you’ll thrive. Read Paul’s prayer for the growth of some new believers in Ephesians 1:17-23. What are your three biggest questions about God? Answer: Live for Jesus your Lord each and every day!